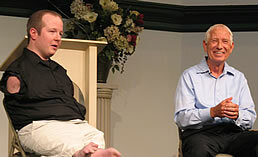 Chet McDoniel started as a Christian Speaker in 2006 when Chet’s dad, Jim, wrote a book about Chet’s life. Since then, Chet and Jim have been able to tell this story in front of tens of thousands of people. They use humor and stories about Chet’s life in order to make their point that God can use you no matter what you look like…even to become a Christian Speaker. All He Needs for Heaven – This presentation is Chet’s favorite to give as a Christian Speaker. It involves his father, Dr. Jim McDoniel joining him for a special look into the life of a family with a handicapped child. Dr. Jim McDoniel begins the presentation by telling the sad tale of the events of Chet’s birth, and throughout the presentation, the McDoniels tell stories and give life lessons that will inspire you to live life to the fullest. This presentation is based on a book that Chet and his dad wrote, which is about to be printed in its 2nd edition. Your youth group/church members WILL BE BLESSED by this presentation from these exceptional Christian speakers. Thanks for doing such an amazing job leading our young people and adults in times of praise at TCC. They were inspirational. So many hearts were prepared to receive the call of Christ because of the worship. You have so much energy and the praise team loved working with you. Worship ROCKED! May the Lord bless you and keep you. As Christian Speakers, Jim & Chet bring a unique tag team approach and lead powerful worship and a message based on their book All He Needs for Heaven. Few messages have blessed my wife and me like Jim and Chet’s.